Word on the street is that this is the best year for pheasants in a long time. If you're looking for a guide to take you pheasant hunting, contact Mike Finley at the Finderosa Ranch. Apparently, the "Everyday Math" curriculum isn't turning out so well. “The curriculum’s failure was undeniable: Not one of my students knew his or her times tables, and few had mastered even the most basic operations; knowledge of multiplication and division was abysmal. . . . what would you do, if you discovered that none of your fourth-graders could correctly tell you the answer to four times eight?�? In this post, I will attempt to capture my travels through Peru. I was in Peru for roughly 15 days - from Friday November 2 through Friday November 16th. I will upload as much GPS data as practicable, mainly so that I won't forget where I went, as we covered a lot of ground in two weeks. Note: All times are displayed as two hours early, as I didn't change the time in my GPS unit when I got to Peru and, right now, Lima is 2 hours ahead of MST and 1 hour ahead of MDT. I tried to apply a 2 hour time shift when I uploaded the GPS tracks, but never got it work so, you get what you pay for, right? Update: OK. I finally got all of the data uploaded and converted to .kmz files for google earth, and also stored as Magnalogs. So, my tracks are out there for you to investigate, should you feel so inclined. I found that a fairly cool way to view the trip is to launch Google Earth, and then click on each one of the Google Earth links below. When you have clicked on all of them, Google Earth will display them all at once. Then, if you click on the little semi-transparent "play button" triangle near the upper right corner of your screen, you can see my whirlwind tour across Peru, outside of Lima, anyway. Map showing roughly the route I took from Lima to Ollantaytambo. Map showing roughly the route I took to Atalaya, on the banks of the High Mother of the Gods River. Day 4 in Peru - Monday Nov 5, 2007 - Lima, Pisco, Paracas, Ica, Nazca. View in Google Earth or as a Magnalog. Day 5 in Peru - Tuesday Nov 6, 2007 - Nazca, Puquio, Chalchuanca. View in Google Earth or as a Magnalog. Day 6 in Peru - Wednesday Nov 7, 2007 - Chalhuanca, Cusco, Urubamba. View in Google Earth or as a Magnalog. Day 7 in Peru - Thursday Nov 8, 2007 - Urubamba to Ollantaytambo. View in Google Earth or as a Magnalog. Day 8 in Peru - Friday Nov 9, 2007 - Ollantaytambo, Aguas Caliente, Machu Pichu, Urubamba. View in Google Earth or as a Magnalog. Day 9 in Peru - Saturday Nov 10, 2007 - Urubamba, Pisac, Cusco. View in Google Earth or as a Magnalog. Day 10 in Peru - Sunday Nov 11, 2007 - Cusco, Paucartambo, Tres Cruces. View in Google Earth or as a Magnalog. Day 11 in Peru - Monday Nov 12, 2007 - Tres Cruces, Pilcopata, Atalaya, Rio Alto Madre de Dios to Bonanza Lodge. View in Google Earth or as a Magnalog. Day 12 in Peru - Tuesday Nov 13, 2007 - Bonanza Lodge in Manu Reserve. View in Google Earth or as a Magnalog. Day 13 in Peru - Wednesday Nov 14, 2007 - From Bonanza Lodge via Rio Alto Madre de Dios to Atalaya, Pilcopata, Tres Cruces, Paucartambo, Cusco. View in Google Earth or as a Magnalog. Day 15 in Peru - Friday Nov 16, 2007 - Lima to U.S.
Searching for the correct spelling for Chalhuanca, Peru, I found this chic's website called Latitude 54. Looks like she's pretty much schooled me on the South American Road Trip deal, not that that should come as any surprise to anyone. My guess is she doesn't have a 9 year old urchin texting her every day saying "daddy I miss u". I'm finally home in Colorado and off the road for a bit. Rolled in last night to a yard full of snow and a box full of Rubbermaid sleds I had shipped in from Michigan. This morning, we built a fire and now Jen and I are sitting here watching the snow fall from the trees. I'm glad to be home, drinking hot chocolate with the Jen and the neighbors. Dragging the little urchins around the the yard on the new sleds behind the four wheeler. But it's different here than in Peru. It's fall in Colorado, and spring in Peru. Standing here in the snow, rigging up sleds and mediating snowball wars, it's hard to believe that two weeks ago, I was sleeping underneath a mosquito net in a thatched roof hut in the Amazon rain forest. I wonder if Peru was just a dream. I'm going to try to capture my thoughts from the trip to Peru, before they slip away forever. Much of the trip, I was unable to write because either 1) the roads were too bad to use the laptop or 2) I was in the jungle with no electricity. However, I did scribble a lot of notes in my notebook with a pen, so I'm optimistic that those will help jar my memories. Also, I met a ton of people down there, and promised them I'd write, which, of course, I haven't. So, I'm going to try to contact the people I met on the trip, and share my photographs and worthless rants once they are compiled. Stay tuned. 7:15:02 PM Rob How do I get my computer to go into the BIOS setup when I reboot? 7:15:07 PM SMB_Cecilia_167655 Thank you for contacting Dell’s Small and Medium Business Hardware support, my name is Cecilia. How can I help you? 7:15:12 PM Rob How do I get my computer to go into the BIOS setup when I reboot? 7:16:12 PM SMB_Cecilia_167655 Could you verify the model of the computer? 7:16:49 PM Rob i put in the Service Tag. Can you get it from that? 7:17:28 PM Rob Fine system. 7:17:38 PM Rob A dimension. In other words, it's a computer. 7:17:42 PM Rob Well, that's a start. 7:18:18 PM Rob It's a Dell Dimension XPS B866. 7:18:18 PM SMB_Cecilia_167655 Could you verify the express service code please? 7:18:33 PM Rob I already put in the Service Tag. 7:18:48 PM SMB_Cecilia_167655 Thank you. 7:19:09 PM Rob Earlier, someone told me to hit F2. That didn't work. 7:19:36 PM Rob Which logo? 7:19:49 PM SMB_Cecilia_167655 If it doesn't work, please turn off the computer and try again. 7:19:52 PM Rob I did hit it repeatedly. I hit it so many times that it thought the keyboard was stuck. 7:20:04 PM Rob What does the Dell logo look like? 7:20:08 PM Rob I think there are two. 7:20:29 PM Rob then, after that, there's another dell logo before ME shows up. 7:21:01 PM Rob ok. F2 is the plan, huh? 7:21:40 PM Rob will try again. if doesn't work, computer goes into the lake. 7:21:54 PM SMB_Cecilia_167655 Unless it is different in your system. In this case you need to look at these splash screens you have. 7:22:06 PM Rob splash screens don't say jack. 7:22:19 PM SMB_Cecilia_167655 It will say "Press F_ for system setup" or another message like this. 7:22:26 PM Rob never see that. 7:22:38 PM Rob would take all the guesswork out of it. 7:22:53 PM Rob give you some clue as to how to enter the BIOS. 7:22:57 PM Rob Not Dell though. 7:23:04 PM Rob Just feel your way through the dark and pray. 7:23:21 PM Rob Like hunting for the light switch in a peruvian bathroom. 7:23:50 PM SMB_Cecilia_167655 Rob, you’ll be receiving a transcript of our conversation via email. If you require assistance in the future, please visit us online at www.Dell.com/SmallBusinessChat or call 1-800-456-3355. Is there anything else I can help you with today? 7:24:09 PM Rob you can help me carry this piece of trash to the lake when you get off work. 7:24:35 PM SMB_Cecilia_167655 All right. 7:24:45 PM SMB_Cecilia_167655 We do appreciate your business. Thank you for choosing Dell. Have a great day! This slideshow is composed of 212 original images out of more than 6,500 photos I shot in Peru in the first half of November of 2007. These images where captured in Lima, Paracas, Nazca, Chilhuanca, Cusco, Urubamba, Machu Pichu, Aguas Caliente, Pilcopata, Atalaya, and Manu. These images were captured with either my new Canon EOS 40D, or my old Canon EOS 20D. 10 days into my vacation to Peru, I dropped my brand-new-two-week-old Canon EOS 40D camera and Canon EF 17-85mm f/4-5.6 IS USM lens into a natural volcanic hot water spring by the river while bathing. Doh! 9 Crimes by Damine Rice, off of 9. Love of the Loveless by the Eels, off of Shootenanny!. On A Day Like Today by Keane, off of Hopes and Fears!. I Want To Believe You by Lori Carson & Paul Haslinger, off of the Crazy/Beautiful soundtrack. Update: These photos are very rough, and could all use some work. When I find some time, I'll go back and clean up these images so they aren't so awful. Many were shot without filters in the middle of the day. But, hey, what do you want for free? Continue reading "Photos From Peru"
This slideshow is composed of original images I shot in November of 2007 in the Manu Nature Reserve in the Peruvian portion of the Amazonian basin, including the Cloud Forest, the Eyebrow Mountain Range of the Eastern Andes, and the "Alto Madre de los Dios" (High Mother of the Gods) River and surrounding jungle. Most of these images were taken with my old Canon EOS 20D and a Canon EF 100-400mm f/4.5-5.6L IS USM lens, after I dropped my brand-new-two-week-old Canon EOS 40D camera and Canon EF 17-85mm f/4-5.6 IS USM lens into a natural volcanic hot water spring by the river while bathing. Doh! This slideshow (4:24) is a 20 Meg self-playing executable named manu.exe created using Imagematics StillMotion PE+. The soundtrack is I Want To Believe You by Lori Carson & Paul Haslinger, off of the Crazy/Beautiful soundtrack. Update: These photos are very rough, and could all use some work. They were shot with my backup camera, afterall. Also, I have thousands more photographs to dig through from the mountains and the desert, but these will probably be the best of the rain forest images, for what it's worth. I'm going to sleep now, as my plane left Peru this morning at 1:22 a.m. (EST), and I'm exhausted. Continue reading "Manu Nature Reserve"
Outside the airplane window, down below, some island chain with an airport. I’m filling out my US Customs form. (d) soil or have been on a farm/ranch/pasture. 12. I have been in close proximity of (such as touching or handling) livestock. During the previous 2 weeks, I spent 4 days on a small farm/ranch in the rain forest where I was been attacked by a Spix Guan on a farm in the rainforest, fought a dog off of my coconut milk. In Urubambu, I watched a Macaw fight a dog over a bagel. In Machu Pichu, I was attacked by an alphecca. I held a 5 foot caiman with my bare hands in the jungle. I was bit by a dog in Lima. In Peru, I have held or touched alpheccas, llamas, goats, cows, horses, puquios, sheep, dogs, chickens, cats, fish, frogs, tarantulas, and an ostrich. I check “No�? and move on, hoping all the questions won’t be this hard. I'm back in the country. Sitting in Atlanta right now waiting on my plane to depart. Flight from Lima to Atlanta was long. We took off at 1:22 a.m., and landed at 8:30 a.m. EST. So, it was a seven hour flight and I didn't sleep much. When I tried to clear Immigation, they told me to "Speak English". I didn't even realize I was talking in Spanish. Doh! Just returned to Cusco, Peru from 4 days in the Manu Nature Reserve on the Rio Alto Madre de los Dios in the Amazon Rain Forest. 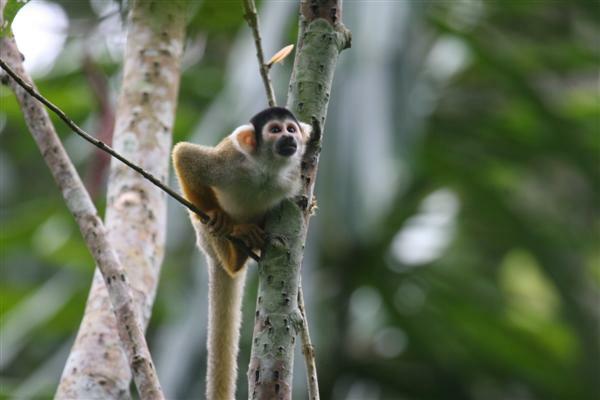 In the Amazon basin, we saw blue headed parrots, Macaws, Toucans, frogs, tarantulas, army ants, fire ants, gun ants, capybaras, flycatchers, herons, caiman(s), brown capuchin monkeys, squirrel monkeys, Dusky titi monkey, too many animals to believe. And, to top it all off, I saw a photographed a Puma in the Manu Nature Reserver yesterday afternoon. No one could beleive it because a) Pumas are extremely rare and 2) Pumas live in the mountains, not in the jungle flatlands. About 7 or 8 People that have lived in Manu all of their lives were crowded, barefoot around my PC, barefoot, beneath a thatched roof, gawking by candlelight around my PC, high-fiving the gringo loco because they've lived here 30, 40, or 50 years, and never seen one. It was awesome. Somehow, we avoided a harrowing head-on collision with a yellow truck today at about 14,000 feet above sea level in a blind hairpin near the Western entrance to Manu National Park. Very close to death. No more riding in the Andes for me. It's just too dangerous. Indescribably dangerous. So dangerous that even I will never do it again. Tomorrow, I fly from Cusco to Lima. Crazy. I'm sitting here in Trottomundo's (Globetrotter's) on the Plaza de Armas in Cusco, and the tourists are walking by my Suzuki 4x4 SUV, gawking in horror. We just returned from 4 days in the Amazon jungle, and the car looks like it. It's covered in mud, top to bottom, and all these tourists are walking around this fancy little plaza looking at my silver jungle mobile gawking and going "wtf?" Hilarious. Oh my god I am glad to be alive after our near accident today. Speaking of cameras, former Special Forces soldier and freelance journalist Micheal Yon reviews cameras he has used for reporting from combat zones. The first installment can be read here. Hopefully, Rob's cameras -- nor Rob himself -- won't see as much abuse. "Test Your Lenses When You Get Them"
Continue reading ""Test Your Lenses When You Get Them""
Here's a photo of me and my two guides stuck in my rented Suzuki 4z4 in the Paracas National Park. I woke up this morning in the Urubamba valley, then watched a local parade of sorts. Not sure what they were celebrating, but they seemed to be very sincere. The local population, largely descendants of the Incans, were drinking something from a barrel in the middle of the street. So, of course, I tossed my beer into the gutter and asked them to fill it up for me. Turns out it is a drink they make called Chicha. Not sure how they make it, but it is somehow connected with the long wooded poles with a red bag on the end that I see every hundred yards or so. It tastes...welll...about what you'd expect something to taste that ferments on a stick in a red bag at the end of a pole in a third world country if you served it out of a barrel in the middle of the street. I almost screwed up though because I started to taste it without pouring some on the ground first. Big no-no with the indians. First, you pour out a little sip on the ground for "pachamama" (mother earth). God I love this country. Chino (my driver, interpreter, and bodyguard) and I rolled into the ancient Incan capital of Cusco this afternoon/evening. We're sitting here in Cafe Trotamundos (loosely stranslates as Globe Trotters), pounding cervesas and pisco sours. Vacaction has been excellent so far. Can’t describe how cool the drive was from Nazca to Cuzco, but if you’ve ever done it, you know. Chino used to live in Cusco, and he knows these people really well. Every town we go through, he runs into people he knows. In every town, he knows the restaurants, hotels, etc. In Nazca and we had to pay $8.00 a night for a room, and I impressed on him for some time that I am not rich and, in the United States, $8.00 is a lot of money. Gas here is 17 Sol ($6/ a gallon) and I make him shut off the engine instead of leaving it idling. Yesterday, in Puquio, we found some cuy (guinea pigs) for lunch, but they would not let me photograph them. I swear this is true. Photos are just too strange to be believed. I've been to Mexico City and Montego Bay and Havana and the Bahamas and, believe you me, they don't hold a candle to Peru. I've been shooting 500-1000 frames a day for 5 with two cameras. Lima - Day 3 - A man named "Chino"
Juan, Guido, and Chino have been very good to me. Great people. The very best. If anyone wants to hear more of the Peru story, email me, and I'll forward to you parts as they come together. But it's very rough. Not enough hours in the day to shoot and write and drink and sleep. Something has to give so I'm only getting a couple hours sleep at nights. Story is unfortunately morphing into brief audio recordings stored on cell phone, cryptic notes in MS Word, and entire story is in danger as it devovles into an incomprehensible quilt of Quechan, Spanish, and English. Not sure anyone will make heads or tails of it now or ever. Or if it's even worth sharing, but it does keep getting weirder by the hour. J-lo, I intended to Skype you tonight, but ended up getting drunk with some witches at a 500 year old Incan temple. One day, you may understand, though that day probably won't be today. J.R, If for some reason I'm never heard from again, get with JP. Juan's buddy in Lima is Guido. Chino is Guido's buddy. I think you know what I have with me. So, this is all I have to say for now. We are well prepared for the trip, with arms and maps, but probably no internet access in desert, mountains, or jungle. All toys are yours per our discussion, but again, proceeds should be funneled to J-Lo per the "Modified Thomas Keys Plan" (25, not 18). I'm still alive. Shot over 600 images with the EOS 40D today, but the camera is more different from the EOS 20D than I had imagined. For one thing, 6.5 frames per second is too fast. It's absurd. 5 frames per second was plenty flast. Trust me. Today, I tried shooting with both frames, but I need a circular polarizing filter for the 100-400 mm lens, and a second memory card. Will try to pick these up at the mall tomorrow before I head out for Paracas and the Nazca Lines. Trip is too strange to believe. I owe a great deal to Juan for taking me under his wing, and to Chino for watching my back all day in Lima while shooting at el puerto and la puente. As the 757 rises above the plains of eastern Colorado, it occurs to me that I am flying to Peru. Like, I’m really doing it. I’m flying to South America for a two week vacation in Peru, a country the state department generously describes as a “developing country�?. I am ecstatic at this epiphany of sorts. I have escaped from the collapsing prison that is my home in the Rocky Mountains. As the fields fall away beneath the plane, I study the patterns in the fields. When the crops were in, the farmers had carved the fields, into a peculiar patchwork of efficient but intriguing patterns in the fields. The farmers plowed their lives into the arid soil, each creating a unique six hundred forty acre canvas, framed by the incorrigibly straight county roads., written in their own unique font. As we rise above the earth canvas, above the collage of accidental artists, I am reminded of nothing so much as Nazca lines on the plains of Peru. And now I’m a child again, in the fourth grade, and all of us boys are loosed upon the library, efficiently culling the facts from our modern day Library of Alexandria. Drooling over photos of allied bombers raining countless bombs on Europe, the Blue Flame, the statues of Easter Island. We’re just waking up. Coming of age. Cherry picking the world, sliding the books across the table, the photos of things too bizarre to be believed and those Nazca Lines in Peru. Why would someone have created them, hundreds of years before man could fly. This was when we were young, when anything was possible. But, on that day, when were nine, on that day in the library, pouring over the books that we’d be allowed to peruse unsupervised, anything was possible. But now, But now we’re older. Some of us, anyway. Tim didn’t make it, but I think the rest of us are still alive. And with every day that passes, the Nazca lines seem further away, somehow. More remote. More exotic. Less likely to ever fall into our direct lines of sight. When we were 9, it seemed like for sure we could go anywhere we wanted to. Easter Island. The moon. It didn’t matter. All were attainable, and they were. But that was then, and this is now. As I grow older, it occurs to me that you don’t ever have to plan to “not go to see the Nazca lines�?. All you have to do is keep doing what you’re doing. And, odds are that, if you’ve never been, then you’ll never go. We are, in the end, creatures of habit. Each day, our ruts grow deeper. Continue reading "First Day in Peru (Lima)"
Pilot and co-pilot on a Frontier Airlines flight snoozed as the plane flew into the croweded airspace over Denver International airport at Mach .82. A commercial pilot and his first officer fell asleep while approaching Denver International Airport in an A319 Airbus jet, going twice the speed as allowed, according to a federal safety Web site. "No rest. Just straight seven hours and 55 minute-flight to Baltimore and back. On this particular day in March 2004, after two previous red-eyes, this being the third red-eye in a row, the last 45 minutes of the flight, I fell asleep and so did the first officer," the pilot wrote. "Missed all the calls from Air Traffic Control to meet crossing restrictions (where pilots have to be at a certain altitude at a certain location) at the DANDD intersection (the intersection in the sky) in the southeast corridor to Denver. The crossing restriction to be at DANDD was to be at flight level 19,000 and 250 knots. Instead we crossed DANDD at 35,000 feet at Mach .82 (approximately 590 mph)," the pilot continued. This makes me feel safer about flying today. I'm off to Peru for a few weeks. I'll be back eventually. Don't try to rob me, because the house is booby trapped, and Mark and Bud are watching it like a hawk and Bud used to kill people for a living so, if you're looking for places to break into, this is a bad choice. A very bad choice. "The Shining Path (Sendero Luminoso) terrorist group is still active, and sporadic incidents of Shining Path violence have occurred in the recent past in rural provinces of Ayacucho, Huancavelica, Huanuco, Junin and San Martin." 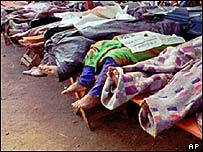 "A peace treaty ending the Peru/Ecuador border conflict was signed on October 26, 1998. The Peruvian Government is working to remove mines and unexploded ordnance left over from the conflict, but crossing or approaching the Peru-Ecuador border anywhere except at official checkpoints can still be dangerous." "Violent crime, including carjacking, assault, and armed robbery is common in Lima. ... "Express kidnappings," in which criminals kidnap victims and seek to obtain funds from their bank accounts via automatic teller machines, occur frequently. Thieves often smash car windows at traffic lights to grab jewelry, purses, backpacks, or other visible items from a car. This type of assault is common on main roads leading to Lima's Jorge Chavez International Airport, specifically along De la Marina and Faucett Avenues and Via de Evitamiento, but it can occur anywhere in congested traffic, particularly in downtown Lima. Travelers are encouraged to put all belongings, including purses, in the trunk of a car or taxi. Passengers who hail taxis on the street have been assaulted. Following the May 2003 armed robbery of a U.S. Embassy employee by a taxi driver, the Embassy’s Regional Security Officer advised all embassy personnel not to hail taxis on the street. " "Crime also occurs on roads, particularly at night and outside of urban areas. Clandestine, impromptu roadblocks can appear on even major highways, where bus and automobile passengers are robbed. The risk is even greater on rural roads after dark." "In jungle areas east of the Andes mountain range (cordillera), chloroquine-resistant malaria is a serious problem. Cholera, yellow fever, hepatitis, dengue fever and other exotic and contagious diseases are also present. Yellow fever is endemic in certain areas of Peru; in general, those areas are located on the eastern side of the cordillera and at lower elevations in jungle areas. The U.S. Centers for Disease Control and the Peruvian government recommend that travelers to Peru receive a yellow fever vaccination and carry documentation of the vaccination with them on their trip. 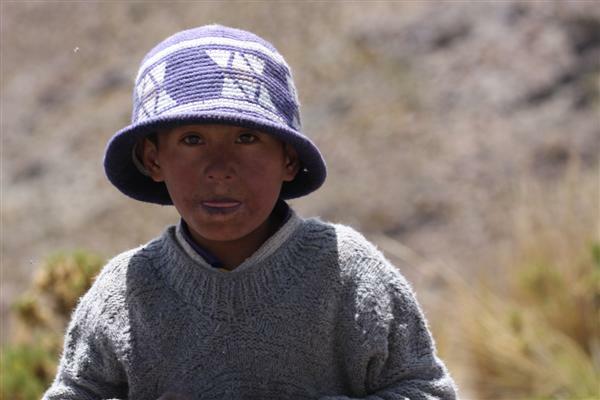 Diarrhea caused by contaminated food or water is very common in Peru, and is potentially serious. If suffering from persistent symptoms, seek medical attention. Local tap water in Peru is not considered potable." What I remember most about Peru was when President Fujimori ordered the storming of the Japanese embassy in Lima after it was seized by Tupac Amaru Revolutionary Movement(MRTA) in December of 1996. And I remember when, a few years later, President Fujimori was running around the streets of Lima, searching desperately, but in vain for his spy chief Vladimiro Montesinos, who was suddenly appearing on every local channel bribing public officials. And then Fujimori fled the country shortly thereafter. I never could understand how a Japanese guy ended up running the country of Peru, but, it doesn't matter now as they're both in prison in Peru - Fujimori and Montesinos - and Guzman, as well, for that matter. They keep Guzman, the former head of the Maoist Shining Path guerillas (a.k.a. terrorists), in his own private prison on an island off the coast of Peru. More on the Sendero Luminoso(Shining Path) here. Update: Also, I searched my archives, because I had some idea that someone famous had been trained down there in Peru at a school similar to the School of the Americas in Fort Benning, Georgia and, sure enough, Manuel Noriega trained at the infamous Military School de Chorrillos in Lima. It's a small world, isn't it? Paul Tibbets, the pilot of the Enola Gay that dropped the first atomic bomb on Japan, has died. He was 92. Paul was a hero, because the bombing of HIroshima was the beginning of the end of WWII. Remember, you're reading this in English because we won the war. So, yeah...he was a hero. Hillary says she thinks it "makes sense" to give illegal immigrants driver's licenses. I think we should let them run for President against Hillary.